Business metrics – track cost per lead and forecast revenue of marketing campaigns. Paid search campaigns – track key metrics within Google AdWords and Bing Ads search advertising platforms. Call analytics – integrate with your 3rd party call analytics provider communicating call data for both online and offline marketing campaigns. 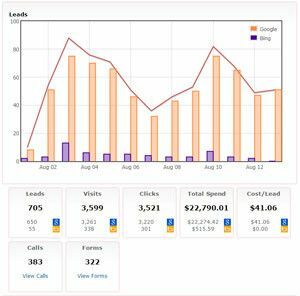 Website analytics – relevant data mined from Google Analytics. Website form submissions – properly identify and filter the source of forms submitted on your website. Offline marketing campaigns – utilizing tracking phone numbers, keep track of your offline campaigns relative to online campaigns. Other campaigns – track banner advertising, social media, or any source sending traffic to your website with a higher level of clarity. For convenience, email summary reports can be sent at a desired frequency keeping key metrics in front of you. Continually improving the product based on customer feedback and market needs, the Wachae Dashboard aims to be an invaluable tool for your business. The dashboard is included at no additional charge with Search Marketing Management. Special custom integration needs may require additional development fees. How complicated is the dashboard to setup and figure out how to use? It does take planning and some effort to get all tracking in place to start. First, we work close with you to ensure proper metrics logical to your business have been identified and incorporated into the dashboard. Second, we assist with technical implementation needed to execute the plan. Once all tracking is in place, the dashboard has been designed to be simple to understand with little to no instruction. How exactly do you incorporate phone call data? We can integrate with any call tracking provider that provides an API which is provided by most call tracking providers. If you currently do not have call tracking in place, we can provide a solution for you. Can I access the dashboard on my mobile device? Yes. The dashboard has been customized to work on all screen sizes. In addition, email summaries are sent regularly which can be viewed on any device as well. If you’re considering our Search Marketing Management services, we’re happy to give you a demo of the dashboard. Contact us to schedule a convenient time for you. We currently do not offer a free trial due to the amount of time/effort required on our part to properly setup and configure the dashboard to fit your business. That said, you’re not locked in any long term contract with our Search Marketing Management services.